Given the huge revisions to recent labour force data published by the ABS data yesterday, it’s now clear that the ABS is suffering from the impacts of funding cuts in recent years (see this ABC news report), and this has the potential to compromise macroeconomic management. The labour force data comprise timely, generally reliable estimates of the state of the Australian economy that the RBA considers in its deliberations over monetary policy. But how is the RBA supposed to interpret data where Australian employment growth in August is reported as 121,000 in the September publication, but revised to 32,000 in the October publication? Incidentally, the new data show employment having fallen by nearly 30,000 employed persons in September. A good summary of the most recent data is contained in Pete Faulkner’s post Confusion over the ABS jobs numbers. 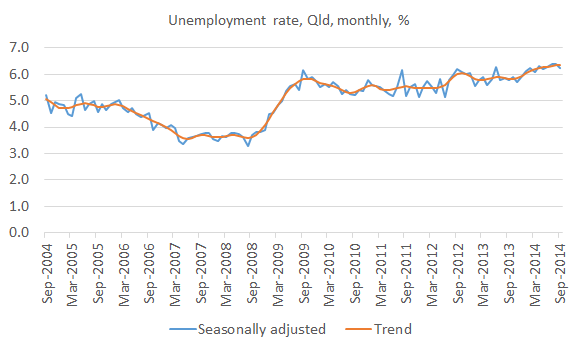 The revisions to recent data mean that Queensland’s unemployment rate (6.4% trend, 6.3% seasonally adjusted) is now at a lower level than we thought a month ago (6.7% in both trend and seasonally adjusted terms), but, in trend terms, it is still higher than anytime in the last decade. Any jobs recovery which QLD had been enjoying this year would appear to have been comprehensively wiped out by today’s data. The huge recent data revisions are due to the ABS no longer having confidence in its seasonal adjustment procedure and abandoning it for the most recent months. This is an extraordinary development. There is now an urgent need to restore funding to the ABS so we can get high quality data on the state of the economy. This entry was posted in Labour market and tagged abs, australia, employment, labourforce, qld, unemployment, unemploymentrate. Bookmark the permalink. Do you honestly think that giving the ABS more funding would make their seasonal adjustment process any more reliable? Not necessarily. But the ABS has been complaining about the risks to the quality of data from budget cuts and efficiency dividends for a few years now and I think it’s about time we take those concerns seriously. Possibly ABS should boost the LFS sample size and pay greater attention to enduring new sample members aren’t significantly different from the ones they’re replacing. If it can do this within existing resources by cutting less important collections that would be fine by me, but I wouldn’t object to an increase in ABS funding. It’s one of the best things the commonwealth spends money on.